Wine tastings are not only about tasting scores of wines, it is the occasion to meet the people who crafted them and invested all their passion into the vineyard management and the vinification. This page will list some of the most exciting wine tastings and wine gatherings in France. Some of these events are for professionnals only, but you will have a contact email or a phone number to apply. Many of these wine gatherings are very small, if not intimate and the vintners will always be there in person to explain and share their wines. Professionnal tastings are often held on mondays, because as many restaurants are closed that day, restaurateurs and sommeliers can attend. I will regularly enrich the content of this post with the coming wine events and will try to keep its link at the top of the right column. Keep in mind these wine events because they come back every year at about the same time. 22 outstanding vignerons working organicly and biodynamicly present their wines in the beautiful setting of the barge "Melody", pleasure and great experience on the quais de Paris... See here for who' taking part. You can buy the wine you like at the estate's rates. A great tasting event in a beautiful Loire town, Blois, one hour only from Paris by TVG high-speed train (from Gare d'Austerlitz, trains every hour). Artisan winemaker working without additives. You can reserve for dinner with all these vignerons, no-misss experience, with the occasion to sit and chat with them and drink all their wines... You can also purchase all these wines at the estate's rate. Here is the list of all the participating vignerons. For the dinner saturday evening, send a 20 € check per person before november 25th to : Philippe Texier, la Rue Colin 41700 Cheverny. A great wine fair with very good vignerons making natural wine, lots of fun and a friendly atmosphere. Domaine des Foulards Rouges - Domaine de l’Anglorre - Château Ste Anne - Mas de Bégude - Domaine de Mazel - Raymond Le Coq - Les Cailloux du Paradis - Domaine Renée et Agnès Mosse - Domaine des Griottes - Domaine Gérard et Bruno Schueller - Georges Descombes - Pierre Beauger - Axel Pruffer - Brasserie de la Pigeonnelle - Alain Allier - Jean-Marc Brignot - Domaine Fontedicto - Les Casots de Mailloles - Sébastien Riffault - Patrick Bouju - Thierry Renard - Jean Maupertuis - Domaine Sophie et Jérôme Saurigny - Domaine de l’Arbre Blanc - François Dhumes - Marie et Vincent Tricot - Domaine Le Brisseau - Philippe Jambon - Alexandre Bain - Nicolas Carmarans - Domaine du Moulin - Brasserie Barbaroux - Clos Fantine - Andréa Calek - Cyril Zangs - Alain et Thérèse Réaut - La Sorga - Domaine de Montrieux - Samuel Boulay. Home page of the wine fair, browse the wineries by Appellations or region. ........................................................ Salon des Vins de Groslaymarch 27 & 28 2010Salle polyvalente, place Ferdinand Berthoud5 € fee, open to the publicphone for info : 01 39 83 32 93A very serious tastind event with some 50 wineries taking part and where you can buy from the vignerons if you want to. The estates are artisan minded and natural-wine oriented. Groslay is a few km north of Paris. Rhone en 4Monday, march 29 2010Brasserie Le Printemps, Bd Haussmann, Paris (under the glass dome in the top story of the store)11am-6pmfor professionals - free entryA wine tasting event in a great setting if you've never been to this brasserie under the dome of the department store. Long list of wineries taking part. See the participating wineries here. Rouge & Blanc page on the event. ........................................................ Les Plus Belles Caves CoopérativesMonday, march 15 2010St James & Albany, 202 rue de Rivoli, Paris11am - 7pmfree entry - for professionalsphone 01 44 75 53 04 - 06 64 91 86 61The best coops from the French region. Many good surprises I guess, as they keep improving their vineyard management and their vinifications. Côte Roannaise & Côtes du ForezMonday, march 15 - 10:30am to 6:30pmSalon 37, 37 rue Marbeuf 75008 Parisfree entry - for professionalsList of the participating vigneronsGreat opportunity to taste these two "minor" Appellations located near Lyons and find some hidden gems. Domaines familiaux de BourgognePavillon Ledoyen, Paris (Ch. Elysées)Monday march 8 - 10am to 5pmFree entry-Strictly for professionalsA iconic wine tasting event, the best from the best. Organized by the Agence Clair de Lune. phone 01 42 89 17 32 le Pech. There will be several artists displaying their creation too. Clos Roche Blanche, Villemade, Tessier, Robinot, Christophe Foucher, Junko Arai, Michel Augé, Allion, Mickaël Bouges, Joël Courtault, Noëlla Morantin, Lemasson, Puzelat, Pierre-Olivier Bonhomme, Potaire, Quenioux, Simonutti, Renaud Guettier, Jérome Sauvëte, Cyrille Sevin, Christian Chaussard, Courtault/Tardieux, Samuel Boulay, Emile Heredia. Don't miss (reserve with the invitation (Pdf document)) the dinner with all these vignerons, it's only 20 Euro and a rare opportunity to share a meal with the very people who make these wonderful wines (limited number of guests, so reserve early). ........................................................ Anges Vinsnovember 28-29-30 2009Saint Aubin de LuignéFree entryThis tasting event takes place near Angers in the Loire, don't miss if you're in the vicinity, many good vintners with great wines, just look at the list on this link. Toby Bainbgridge is the Brit who works for Domaine Mosse, he has also some vineyards of his own. See the other pages on the linked site for more info ........................................................Dégustation des Vins de Savoie et BugeyMonday, november 16 2009La Robe et le Palais13 rue des Lavandières 75001 ParisMetro ChateletDay long tasting event For professionals - free entryA rare occasion to taste wines from the Bugey and Savoie in Paris. 10 vignerons taking part, the place is a good restaurant known for its interesting wine list; it is only a stone throw from Chatelet on a quiet side street. Estates : Domaine des Ardoisières, Domaine Gilles berlioz, Domaine Giachino, Domaine Louis Magnin, Domaine Jacques Maillet, Domaine E & R Saint Germain, Domaine de Soleyane, Domaine Franck Peillot, Domaine du Cellier des Cray, Domaine Prieuré Saint Christophe. Download the invitation, plan and list of the participating vignerons [Pdf]. Excellent selection, several of these vignerons have been visited by Wineterroirs by the way (Philippe Jambon, Olivier Merlin, Alain Hasard). ........................................................Vignerons NaturelsLes Noces de Jeannette14 rue Favard / 9 rue d'Amboise75002 ParisMonday, november 9 - 10am to 7h30pmMetro Richelieu-Drouot; Bourse; 4 SeptembreFor professionnals - free entrycontact : 100pour100purjus [at] free [dot] frVery convivial tasting event in this charming restaurant in the middle of Paris. 10 vingerons only, but well chosen : René Mosse, Stéphane Tissot, JC Lapalu, Béatrice & Pascal Lambert, Mathieu Barret, Jean-Luc Bernard, Yves Canarelli, Jo Landron, Dominique Belluard, Philippe Viret. Not to miss. If you're too short to contact the email, you should be able to enter if you explain what you do in the trade. ........................................................Salon des Vins des Vignerons IndépendantsNovember 26-30 2009Porte de Versailles - ParisOpen to the public - Entry ticket : 6 Euroyou know it now, this is THE wine fair by excellence, 1000 wineries taking part, all the wine regions, all type of wines and alcohol... Homepage of the fair. To see who's there, select an Appellation then click on "Lancer la recherche" on this page. Note the stands (for example D 70 or D 5) after selecting the estates in advance that you want to taste, there is no way you have time to taste everything there.Prefer the weekdays, it's crowded on the weekend. Begin as early in the morning as possible, the vignerons will be more available for a talk. There's the possibility to eat in the fair (good charcuterie/foie-gras stands). Send your name/profession/references before oct 15 to ugc (at) ugcb (dot) net for registering. Fax : 05 56 51 64 12. ........................................................29ème Rendez-vous des Professionnels du Vinmonday, october 19th 2009Pavillon Dauphine, ParisMétro Porte DauphineFor Profesionnals - Free EntryVery nice list of wineries taking part here, about 70 of them, from all the French wine regions. Free buffet with charcuterie, cheese and breads prepared by Philippe Olivier. Phone for the Club des Professionnels du Vin : 01 47 63 17 17 - contact (at) clubproduvin (dot) com You can register online. ........................................................Les Vins du Sud-Ouest à ParisMonday, september 7thLa Bellevilloise, 19-21 rue Boyer Paris 75020 Metro Gambetta (line3/3bis)Professional tasting - Free entryA wine-tasting event with 35 vignerons offering their wines to the public. Appellations are Armagnac, Bergerac, Cahors, Duras, Fronton, Gaillac, Jurançon, Madiran, Marcillac and Marmandais. Very interesting because not very well-known. A few estates names : Tariquet, Joÿ, Ancienne Cure, Joncal, Lamartine, Mourhes-le-Bihan, Le Roc, Plaisance, Plageoles, Rotier, Causse Marine, Gineste, Cauhapé, Uroulat, Bordenave, Larreyda, Jurque, Bellegarde, Aydie, Labranche laffont, Berthoumieu, Basté, Cros, Elian Da Ros. Free buffet between noon and 2pm : Dishes from the south-west prepared by Michel Dussau, Chef at La Table d'Armandie, a gastronomic restaurant in Agen. ........................................................Haut les Vins !Chateau de Cujac33160 Saint-Aubin-de-Medocjune 22-23 10am-8pm / 10am-6pmFree entry - Open to professionnalsAnother outstanding artisan vignerons meeting off Vinexpo.52 vignerons take part, look at the list on the Haut les Vins page (make sure to check page one and page two). There's a shuttle from Vinexpo, look on the website, I think it's explained there. Contact : hautlesvins at gmail dot com ........................................................ Union des Gens de MétierChateau Tour du Pas Saint-Georges33570 Montagnejune 22rd, 10am-5pmFree entry - Open to professionnalsA unique artisan-vignerons tasting event off Vinexpo. Very close to Saint-Emilion, this event gathers people like Philippe Allet, Jean-Marie Chermette, François Chidaine, Eloi Dûrrbach, Mrs Hegoburu, Christophe Peyrus, Jacques Puffeney, Jean-Marc Roulot, Robert Plageoles, Pascal Delbeck and others (23 estates altogether). Contact : François Chidaine, phone +33 2 47 45 19 14. mail francois dot chidaine at wanadoo dot fr ........................................................ Vignerons bloggers meetingJune 22Chateau Luchey Halde, 33700 MérignacLink to the event's web page with the list of the vignerons who take part, including Iris who runs a nice website with lots of information on her vigneronne job. The Chateau Luchey Halde is also a great place to meet and this will make a change from the Vinexpo crowds... ........................................................Les Toqués des DentellesMonday, april 27Pharamond24, rue de la Grande Truanderie 75001 Parisphone 01 40 28 45 18Free entryAn outstanding small tasting event with a bery nice and compact list of vintners from the Rhone. You can look at the vignerons taking part on the invitation : Download the invitation for the Toqués des Dentelles [Pdf] (1364.1K) ........................................................La BeaujoloiseApril 20 - 10am to...lateAncien manège de SermezyCharentais (north of Lyons)For professionals and the publicNo entry feeExpect to enjoy wine and the exchanges with vignerons very late into the night. The Beaujoloise is one of the most interesting tasting event that draws people for the wines (and the presence) of Marcel Lapierre (Beaujolais), Pierre Overnoy (Jura), Jean Foillard (Beaujolais), Jean-Paul & Charly Thevenet (Beaujolais) and of many others (check the click-on list on the link). Don't miss the dinner and reserve.........................................................Vini CircusApril 10-13 2009Hédé (north of Rennes), BrittanyFor the professionals and the publicEntry fee 6 Euro - glass offeredAn exceptional tasting event by the number and quality of the participating vignerons but also because of the ambiance, the discussions and exchanges, and the repas des vignerons where for a mere 20 Euro you can enjoy a meal with the very people who make the wines you like. Vinicircus is also a place where you can taste non-wine artisanal products products like Bordier butter. Several cooks present their recipes inspired by these wines. See the Vini Circus program for each day. Salon des vins des vignerons indépendantsParis, Porte de ChamperretMarch 27 - 30Entry fee 6 euroThe second largest wine fair in Paris, the salon de la Porte de Champerret is the sister-wine-fair of the november one at the Porte de versailles. A bit less wineries there but still hundreds of them from all the French regions. Unlimited tasting, so be sure to spit in the buckets. Choose a region on the website to see who takes part. Salon des vins de GroslayGroslay, North of ParisSalle Omnisport Jack PicheryMarch 28 - 29Phone : 01 39 83 32 93email : cave (dot) du (dot) clos (at) wanadoo (dot) frA small size and little known professional tasting event (non professional are welcome too) with 45 of the best artisan vignerons. Découvertes en Vallée du RhoneMarch 16-23 in several locations of the RhoneFor professionnals - Free inscription and entryAn exceptionnal regional wine event, the Découvertes en Vallée du Rhone is a must.The online registration is easy and opens the way to this week-long tasting event where you'll taste the very best of the Rhone and meet its vintners. The food served for lunch usually on the buffet mode is free and excellent, another reason not to miss. As soon as you'll have registered, you will have access to the online list of the 750 participating vignerons. Link to the contact page (phone, fax, email) for more info. See this post about our visit to the 2007 Découvertes en Vallée du Rhône (the villages and locations change every year). Salon des plus belles Caves CoopérativesMonday, march 16 2009Hotel Saint-James & Albany202 rue de Rivoli, Paris 7500111am - 7pmfree entry - professionnals onlyDirectionsA very important wine-tasting event and quite rare actually : the best French Coops (about 30 of them) offer their wines to taste and you get a chance to speak with the vintners and learn about their vinification style and philosophy. Of course, the now-famous Caves des Vignerons d'Estézargues takes part, but many others among the participating coops are worth the visit. To attend, you can contact the organizer, SO2, at SO2((at))neuf((dot))fr or call at (o)6 64 91 86 61........................................................La MiseSunday, march 15, 10am - 7pmle Patio, 51 chemin Barriol13200 ArlesEntry fee : 5 EuroNice list of participating vignerons for this wine-tasting event in the nice Southern-France city of Arles (map). All of them are well-known in the natural-wine world and come from the major French wine regions. A dinner with the vignerons, cooked by chef Katsumi Ishida, is a must in the evening (reserve early, price : 25 Euro). One of the richest and most passionating wine fair (I know, I may have already said that a couple of times...) that you can find in France. It used to be in Angers at about the same time than the Loire-wines fair but for some reason it moved north and is now coupled with the Salon Omnivore, a similarly-interesting fair centered on slow food where tickets cost 40 € (online registr.). This wine fair is gathering many artisan vignerons, and while you'd be already happy to meet in person any single one among them, gauge the quality of the hosts by looking at the names on this huge list of participating vignerons who come from all the French regions...forget any hope to spend time with each of them, even in two days. To attend, you need to contact one of the participating vignerons and ask for an invitation. You can also contact the organizer Sylvie Augereau :sylaugereau((at))wanadoo((dot))fr. If you don't find a room in Deauville, you can make a day trip by train from Paris. Vers une pleine expression des AOCOrganized by the Renaissance des AOC groupAngers - For professionals, but you'll get inSunday, February 1st - 10am to 9pmEntry fee for the glass : 4 Euro (incl 2 Euro/carbon-footprint compensation - sorry that they gave in to this thing... This wine fair is the Off fair of the Angers wine fair. It takes place in the Greniers Saint Jean not far from the train station of Angers. See directions on the invitation (Pdf file). If I had to choose between the Angers Loire fair and this one, I'd had some trouble deciding. This fair gathers the best of the vignerons working with biodynamie, it is at the same time much more casual, relaxed than the big fair, and what wines ! Just look at the participating vignerons, who come from all the French regions on this Renaissance des AOC Invitation [Pdf]. ........................................................Salon d'AngersAlso known as Salon des Vins de LoireFebruary 2-3-4Practical infoFor professionnalsA big wine fair featuring a huge number of wineries from the Loire region. You(ll be able to meet there in person the best vintners of the Loire, the artisan ones as well as the mainstream ones. Open exclusively to professionnals, make sure to contact someone of the Contact staff to be able to get an entry ticket. To see who takes part in this outstanding wine fair, just select any Loire sub-region at the bottom of the exhibitors page. Make sure to plan long ahead (a bit late for this year) your accomodation for the night because it's fully booked up, or just make a round-trip by TGV from¨Paris (assuming it's not going to have one of its recurrent technical breakdowns that day). If you're in good terms with some vignerons, you might be invited to one of the many private parties that dot the event in private Chateaus around Angers. Jean-Pierre Fleury (Champagne), Catherine & Pierre Breton ( Bourgueil - Chinon), Philippe & Françoise Gourdon (Saumur), Jean-Pierre & Chantal Frick (Alsace), Marie-Laurence Saladin (Côtes du Rhône), Nicolas & Virginie Joly (Coulée de Serrant - Loire), Patrice & Virginie Lescaret (Gaillac), Olympe Minvielle (Bordeaux), Thierry Michon (Fiefs Vendéens), Raymond de Villeneuve (Chateau de Roquefort - Provence), Philippe Chatillon (Pinte-Jura), Marcel Richaud (Côtes du Rhône), Jean-Pierre Deu (Collioure), Paul Barre (Fronsac), Emmanuel Giboulot (Bourgogne). Philippe Alliet (Chinon), Eric Bordelet (Calvados), Philippe Charlopin (Gevrey-Chambertin), Pierre-Marie Chermette (Beaujolais), François Chidaine (Vouvray), John & Véronique Cochran (Cotes de Bourg), Louis Benjamin Dagueneau (Pouilly-Fumé), Pascal Delbeck (Saint-Emilion), Paolo de Marchi (Chianti-Italy), Eloi Dürrbach (no Appellation...), Clos Rougeard (Saumur-Champigny), Alain Graillot (Crozes-Hermitage), Christian & Marc Imbert (Corsica), Olivier Jullien (Languedoc), Marc Kreydenweiss (Alscace-Costières de Nimes), Frédéric Le Clerc (Médoc), Christophe Peyrus (Clos Marie - Languedoc), Domaine Plageoles (Gaillac), Jacques Puffeney (Arbois-Jura), Thérèse & Michel Riouspeyrous (Irouleguy), Jean-Marc Roulot (Meursault), Anselme Selosse (Champagne), Aldo Vajra (Barolo-Italy). Bruno Allion, Béatrice & Michel Augé, Mikaël Bouges, Alain & Joël Courtault, Christophe Foucher, Christian Chaussard, Renaud Guettier, Emile Heredia, Olivier Lemasson, Junko Araï, Pascal Potaire, Thierry Puzelat, Michel Quenioux, Jean Pierre Robinot, Catherine Roussel & Didier Barrouillet, Jérôme Sauvète, Pascal Simonutti, Philippe Tessier and Hervé Villemade. Also a great opportunity to meet the people behind the wines...And you can take part for a mere 20 Euro to the saturday-evening dinner with these vignerons. I can testify that with the food, these wines and this company, the dinner is the best deal in the Loire that day (reserve early)... See this Vins du Coin invitation file [Pdf] for details......................................................... Culture et Vins de Francedecember 6th - 10:30am - 7:30pm - no entry fee (glasses sold 3,5 Euro if you don't have one)91250 St Germain les Corbeil (Paris suburb)A tasting event organized par passionnate vignerons from the French wine regions. Nice guests list including Pierre-Marie Chermette (Beaujolais), Paul Barre (Fronsac), Vincent Boivert (Chateau Fontis), Jean François Deu (Domaine du Traginer, Collioure). Guests are : Mark Angeli, les Griottes, Stéphane Pz, Bruno Rochard, Olivier Cousin, Richard Leroy, Toby Bainbridge (the Brit who works at Domaine Mosse), Benoit Courault, Patrick Baudouin, Jerome Saurigny, Agnès & René Mosse, Didier Chaffardon, Christophe Daviau, Jean-François Chéné, Stéphane Bernaudeau, Jean Christophe Garnier, Christine & Joël Menard, Nadège & Laurent Herbel, Mileine & Eddy Oosterlinck. Charcuteries : Jean-Michel Bonnin ; Cheeses : Jean-Christophe Luce. Download and print the beautiful flyer of the Salon Anges-Vins file [Pdf] for more information.Contact : agnes [at] domaine-mosse [dot] comphone : 02 41 66 52 88........................................................Salon des Vignerons IndependantsNov 27 to Dec 1st, Paris - Porte de VersaillesEntry fee : 6 EuroTHE Paris wine fair by excellence : some 1000 wineries from all the French wine regions, plus distilleries with Cognac and Armagnac, usually with the presence of the owner/vintner himself offer a tasting of their wines. You are given a wine-tasting glass at the door and you can virtually taste thousands of wines (each vigneron having 7 to 10 or more wines, check the arithmetics...). Check the general info for this wine fair. To see who will be present you can either search by region or by Appellation. Click on a given Appellation and then on Lancer la recherche. Don't forget to note the stand coordinates (there are also big boards near the doors to locate the stands) to find them easily, like for example Barmès-Buecher (Alsace) is K5, Domaine aux Moines (Savennières) is R37 and Domaine Saladin (Rhone) is D52. The original thing is that all the stands are mixed in the huge exposition hall so that there's no Appellation-ghetto, and you can hop from tasting, say, a Champagne, to the next stand which may be a Jura or a Burgundy. Even if you can swallow, be sure to use the spit buckets if you want to survive this fair. You can also purchase the wines on the spot and take away your cases. Better go on week days and as early as 10am to avoid the weekend crowds. Dress very lightly because it can feel warm in there when crowded. See this Wineterroirs story to have a feel of the event. Many of the best artisan wineries take part........................................................The Grand TastingParis, november 21st-22nd, Louvre basementMetro : Palais Royal (lines 1 - 7)Entry fee : 20-Euro/day or 25-Euro/2daysAs its name suggests it, this is a very serious wine-tasting event and well-worth the 20 Euro for the ticket. Excellent, rigorous selection of wineries from the French regions plus also from Italy and Spain. Just look at the participating wineries and make your selection to fit the one or two days of your visit. There are a few Master Classes that are very interesting but very expensive (they used to be much cheaper last year, like 15 Euro or something like that...). The event is located in the basement of the Louvre. Download this Pdf document for more information or just browse the Grand-Tasting website.........................................................Biodyvin (Pavillon Dauphine, Paris)Monday, november 17th 2008, 10am-6pmprofessionnals only - no entry feeAnother great tasting event, with vintners who manage their vineyards according to organic/biodynamic principles. Guests at Biodyvin are (I'll not type Chateau or Domaine to save virtual ink) : Bott-Geyl (Alsace), Clos de la Briderie (Loire), Bürklin-Wolf (Germany), Cazes (Rivesaltes), François Chidaine ( Montlouis), Coulet (Cornas), Dirler-Cade (Alsace), Duseigneur (Languedoc), Falfas (Cotes de Bourg), Fonroque (St Emilion), Philippe Gilbert (Menetou Salon), La Grolet (Cotes de Bourg), Huet (Vouvray), Josmeyer (Alscace), La Jucherie (Vouvray), Anne-Claude Leflaive (Burgundy), Maris (Minervois), Montirius (Cotes du Rhone), Moulin du Cadet (St Emilion), La Moussière (Sancerre), Puy Arnaud (Cotes de Castillon), Roches Neuves (Saumur-Champigny), Romanin (Baux de Provence), St Nicolas (Fiefs-Vendéens, Loire), Tour Grise (Saumur), Vacheron (Sancerre), Zind-Humbrecht (Alscace), Valentin Zusslin (Alsace). Good opportunity to meet Geneviève & François Barmès, Françoise Bedel, Anne-Claude Leflaive, Alphonse Mellot, François Chidaine, Thierry Germain, Olivier Humbrecht and others. Domaine René Mosse (Anjou), Domaine A&M Tissot (Arbois), Domaine JC Lapalu (Beaujolais, Brouilly), Chateau Sainte Marie (Bordeaux), Domaine les Chesnaies (Chinon), Domaine du Coulet (Cornas), Domaine Bernard (Côtes du Rhône Villages), Clos Canarelli (Figari), Domaine Jo Landron (Muscadet), Domaine Belluart (Savoie), Domaine Viret (Vallée du Rhône). Address of Les Noces de Jeannette : 14 rue Favart 75002 Paris. Metro : Richelieu-Drouot/Bourse/4-septembre. contact email : 100pour100purjus@free.fr (100% pure juice meaning not a single additive...). Bonjour merci pour l'info mais le 3 décembre est un mercredi...vous pensez peut-être au 3 novembre (ce soir donc)...Merci. Thank you for the information, i'm afraid Blois is to far away for me as is Paris but do you happen to know anything about a tasting called Vin Passion 9 near Lyon on January 17-18. It is in (i belief) les amis de la cugnette. Any information is very wellcome as i can not find any information about it. Magic photo of Pierre and Nicolas. 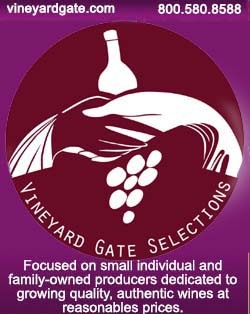 Could you please provide a list of special wine events in 2010 and estimated 2011? I have a French class of 18 adults who have plans to travel to France this and next year and would like to know what special wine events will occur.